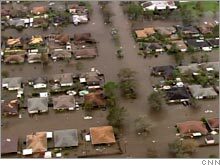 Hurricane Katrina was the biggest natural disaster in US history - and its aftermath became the biggest management disaster in history as well. A year later, Fortune lays bare this surreal tale of incompetence, political cowardice...and rebirth. (FORTUNE Magazine) -- Ruthie Frierson's dining room does not look like the birthplace of a populist rebellion. The room is quiet, insulated from any street noise, with treatments in heavy fabric around the windows. Asian paintings in elegant frames hang on the walls. The ceiling is gilt - not painted gold, but proper gilt, rectangles of gold leaf so thin that a brick of 100,000 sheets would be less than an inch thick. Yet it was here, late last year, that Frierson and several women of her acquaintance first planned to attack the powers that be. In this case the powers were the political establishments in New Orleans, Baton Rouge, and Washington, D.C. - establishments the women believed bore much of the responsibility both for the city's collapse before Katrina last August 29 and for the paralytic pace of rebuilding. Thin, blond, and blue-eyed, Frierson bears some resemblance, in her blazer and scarf, to a younger Nancy Reagan. For people who don't live in New Orleans, her place in society might be summed up by her reputation as the city's most successful residential real estate broker - the person to see about buying and selling its finest homes. Or one might note that at its annual Mint Julep Party the Junior League anointed Frierson the 2006 "Sustainer of the Year." For years the city's debs-and-dinner-parties set was proudly insular, its attention focused on its own affairs even as the city decayed. Corruption, inefficiency, and crime were the subject of ironic jokes over cocktails, not protests; the city's disamenities were treated, all too often, as part of its storied charm. When New Orleans almost entirely missed the '90s boom, it elicited little public dismay. "We make a joke that's not a joke," says Elliott Stonecipher, a well-known political analyst in Shreveport. "Nobody in Louisiana knows what noblesse oblige is. New Orleans is a hotbed of civic apathy - the only city in the country where rich, powerful people don't have their fingers in everything." Katrina changed all that. Like those of most of her Uptown neighbors, Frierson's spacious home is on high ground and hence was not seriously affected by the flood. But when she returned after evacuation - "I came back as soon as you could take a bath" - the devastation threw her into mourning. The city she had lived in all her life was ruined by the largest disaster in U.S. history, a catastrophe that killed 1,580 people. Worse, the political elite seemed not to care. Instead of urgently rebuilding, the mayor, governor, and President engaged in finger-pointing. Her string snapped at the end of November, when the state legislature scuttled a bill to reform the state's levee boards, which are entrusted with maintaining its flood defenses. Critics have long charged that the eight boards in southeast Louisiana did everything but take care of the levees. Rather than coordinate their efforts, they competed for money and influence. Some boards operated their own police forces; the central New Orleans board even ran a marina and an airport, both of which lost money. "People were saying that they were not going to bring their families back" if the legislature continued to entrust the levees to these fiefdoms, Frierson says. "Right then and there, I decided this was the issue." Hours after she learned of the state's action, Frierson was visited by her neighbor Jay Lapeyre, chairman of the New Orleans Business Council. Low-key and conservative in temperament, Lapeyre looks as if he stepped from a box labeled Reluctant Public Figure. Laitram Corp., his family company, manufactures and distributes the creations of his inventor father: shrimp-peeling machines, alternating-tread stairs, and modular plastic conveyor belts. Believing that business should not insert itself into politics and vice versa, Lapeyre tends to be leery of sticking his nose into things too distant from shrimp, stairs, and belts. But now he was in Frierson's living room, irate, with a handwritten letter for the governor. Louisiana, he said, couldn't ask Congress "in good conscience" to spend billions rebuilding if it wouldn't clean up its own act. The state's levee boards had to be consolidated and staffed by professionals. Laitram had six locations around the country, but it didn't have six boards of directors, each out for itself. "I said to Jay," Frierson recalls, "We ought to get signatures on a petition to reconvene the legislature for levee board reform. "He said in passing, 'Oh, that would be great.' I said, 'No, Jay, I want you to draft it with me.' "
Frierson and her husband combed through their Rolodexes. On the Monday after Thanksgiving, their house was packed with 120 friends and acquaintances, many of them wives of Business Council members, most of them from Uptown, the lush neighborhoods around St. Charles Avenue. Lapeyre spoke. The group named itself Citizens for 1 Greater New Orleans and formed an executive committee, which met in Frierson's dining room to plot its course. "The politicians in Louisiana are knitted together underground like an old root system," says committee member Kay Kerrigan, wife of a prominent city attorney. "We realized this has got to change. If we want to rebuild this city, we can't go back to the way it was." Within 3½ weeks, the petition had 53,000 signatures - more than the immediate post-storm population of the city. "We had faxes coming in from [New Orleanians living] all over the country," Frierson says, "copies of the petition with a single signature." Wearing red power suits, the women of Citizens for 1 Greater New Orleans staged an alarmingly tidy and well- organized protest on the steps of the capitol in Baton Rouge. Governor Kathleen Blanco, galvanized by their demands, shoved through a bill in February that consolidated the levee boards down to two, one on each side of the Mississippi. Citizens for 1 Greater New Orleans, for its part, turned its attention to ending Orleans Parish's practice, unique in the country, of having more than one tax assessor - seven, in fact, some controlled by the same families for decades. The multiple-assessor scheme has long been denounced as corrupt; it generates improbably low assessments that drain the city of tax revenue. So opaque is the system that when the administration of Mayor Ray Nagin put assessed property values online, the assessors threatened to sue. In June the state legislature approved a consolidation measure, which goes before the voters in November (it requires amending the state constitution). Joined by more than 20 other newly aroused civic groups, from the Rotary to local think tanks, Frierson promises that Citizens for 1 Greater New Orleans will keep pushing for change. "We're awake now and watching what's going on." It is wholly fitting that safeguarding New Orleans has fallen to its indigenous business class. But the lack of effective response by the political elite - and the lack of public concern about its inanition - is amazing. Failing to rebuild a viable city would have consequences far beyond Louisiana. New Orleans' two ports are, by tonnage, the nation's biggest. They need to be - the region handles a third of the nation's seafood and more than a quarter of its oil and natural gas. Some 4,000 oil and natural-gas platforms, linked by 33,000 miles of pipeline, spread out along the Louisiana coast. Among the facilities are the four largest refineries in the Western Hemisphere. Southern Louisiana is easily as important to the nation's energy supply as the Persian Gulf. As the first anniversary of Katrina approaches, the city has made progress. Gas and electricity have been almost fully restored, though outages remain frequent; as of July, most residents had full postal service. The Army Corps of Engineers has almost finished removing the 300,000 refrigerators in people's yards and has begun work on the 250,000 wrecked cars still on the streets. In mid-June the Corps completed its first-pass rehabilitation of the city's levee and pump system. Nonetheless, the situation remains parlous. Hurricane season is racing to its peak, and New Orleans' infrastructure is so weak another Katrina would finish it off. But even if no hurricanes strike the coast, the city and region must still navigate through three intertwined dilemmas. The first comprises the obvious problems of deciding what areas will be rebuilt and ensuring that the city is protected by a new, stronger levee-and-pump network. Finishing that system will take many years, and until then, people and businesses will be reluctant to invest themselves in the area, slowing recovery. Even as the city reconfigures itself, a second, still bigger reconstruction project must occur in the great wetlands to its south. New Orleans' best defense against hurricanes is not its levees but this vast Delta swamp, which acts as a buffer against storm surges from the Gulf of Mexico. Alas, the coastal wetlands, by far the nation's largest, are disappearing, literally dissolving away. Halting and even partially reversing the land loss is possible. But it will require the biggest, costliest restoration effort ever tried, all at a time when war, tax cuts, and Medicare have depleted the federal treasury. Those two projects - reconfiguring New Orleans and rehabilitating its ecosystem - are daunting enough, and working through them will require a stupendous force of political will, especially in Washington. Here is the third dilemma: That desperately needed political will is nowhere to be seen. Against all that, the efforts of Ruthie Frierson and her accidental activists to save a city and its economy seem a slender reed to lean on. The scale of this rebuilding effort is a reminder of the limits of local self-reliance and the need for effective government. Yet New Orleans' best chance for recovery may lie in its reawakened sense of community, born of shared disaster - because government, it is now clear, will not act unless pushed hard. When the Citizens for 1 Greater New Orleans meet in Frierson's dining room, the view from the windows now stretches well beyond Uptown. It was not the wind or water but the mold. The hurricane ripped away just a little corner of Erin and Trixie Levins' roof. And their two-story house, sitting on a little slope, was high enough to be washed through by only 4½ feet of water, much less than other houses. But the flood sat there for almost two weeks. Day after day the polluted water in the Levinses' living room steamed into vapor, coated the walls, and dribbled back into the liquid below. Erin Levins returned to the city in early October, as soon as the checkpoints opened. As a manager at Cox Communications, he'd used Google Earth to learn that his house was standing. But the blurry images on his screen had not prepared him for what it was like to see his neighborhood vacant and wrecked. Or to discover that every surface inside his home had been transformed into a garish ecosystem - pink, black, white, and green - inhabited almost exclusively by molds. Like tens of thousands of other homes in the city, the Levinses' house was structurally intact but completely consumed. Wearing a respirator and a Tyvek suit, Erin ripped out the washer and dryer; the dishwasher, stove, and especially the refrigerator; and all the furniture, clothing, linens, and papers, including his wife's collection of art books, 3,000 strong. Out to the sidewalk went every scrap of wallboard, pipe and electrical fixture, insulation batt, and most of the floor. Meanwhile Trixie had to locate their new FEMA number (needed to get aid from that body), grid number (debris-collection crews), and flood-zone number (flood insurance). Working out of a succession of temporary homes - a relative's house, a friend's apartment - she set up a Yahoo group to help her scattered neighbors contact one another and she monitored the parade of flood-insurance adjusters, home-insurance adjusters, and mortgage adjusters. In between, she home-schooled their daughter. At one point Trixie tracked down the home number of the president of their mortgage company, which was not releasing the family's flood-insurance payment. "I cried on the phone to his wife," Trixie says. "Half an hour later, his assistant called to say they were FedExing a check." Middle-class, sophisticated, and formidably energetic, the Levinses do not fit the media-abetted impression that Katrina's human impact was reserved for the poor and African American. They live in the Gentilly district, in a prosperous area called Bancroft Park. (After nine months of work, they returned home on July 13.) Every single house in Bancroft Park was badly damaged, and many were destroyed. A half-mile away is Wakefield, another part of Gentilly, but less affluent and predominantly African American. The storm flattened it just as badly. In Orleans Parish, black areas were more likely to be wiped out than white. But in Jefferson and St. Bernard parishes, minutes away from downtown, "the affected areas were more likely to be predominantly white," a Brown University research team reported in January. "Neighborhoods with larger shares of black residents were actually less likely to be heavily damaged." Overall, according to Richard Campanella, a Tulane University geographer, the storm flooded 51% of the white- occupied homes and 67% of the black-occupied homes in the three-parish area - a disparity, but not an overwhelming one. "Those terrible photographs of African Americans crowded into the Superdome showed who couldn't evacuate, not who had their home destroyed," Campanella says. When the storm hit, Louisiana health authorities tallied up the dead. In the three parishes, people of color comprised 52% of the pre- Katrina population and 53% of the dead; in Orleans Parish alone, the numbers were 66% and 62%, respectively. But if race and class did not play a dominant role in the storm, they have dominated its aftermath, both because Katrina's poor and African-American victims are disproportionately affected by the economic burden of rebuilding and because political disputes inflamed by race and class are paralyzing the city government. It is universally expected that New Orleans' population will shrink: A RAND study estimated that it will reach 272,000 - about half its pre-Katrina number - in 2008. When a city downsizes, the worst result is "jack-o'-lantern neighborhoods," in which residents are scattered among abandoned houses, like lights in the darkness. To prevent that, arithmetic suggests that the city footprint must contract. Deciding where to rebuild is thus the primary decision - it is pointless to ask utilities to reconnect neighborhoods that will not exist and cruel to invite homeowners and businesses to return to them. The obvious way to reduce New Orleans is to buy out evacuees from flood-prone areas and bring them to abandoned homes on higher ground. But because whites disproportionately live on higher ground, this would involve parachuting many African Americans into white neighborhoods. In few cities would this be an easy sell. Crucial to the success of any plan would be political leaders with a minimal reputation for color-blindness and competence. Unfortunately, southern Louisianans, black and white, rarely elect them; they're prone to choosing eminences like former state legislator David Duke, founder of the National Association for the Advancement of White People, and William Jefferson, the first member of Congress to be accused of keeping $90,000 of Nigerian bribe money in his home freezer. Since the storm, much of New Orleans' political establishment has fled from its responsibility to make decisions about the city's footprint. In a cringeworthy pattern, city bodies repeatedly hired urban planners, who proposed recovery land-use proposals, which then fell into limbo, neither accepted nor rejected, until they were swept aside by the next wave of consultants. The sequence began in September, just after the flood receded, when Mayor Nagin resorted to a time-honored method for postponing difficult choices: appointing a blue-ribbon panel, the Bring New Orleans Back Commission. In its various incarnations the commission would employ three sets of consultants, none working with the others. First was a group assembled by the Urban Land Institute, a real estate industry think tank. In mid-November the ULI team presented a preliminary plan: Begin rebuilding on the highest ground, then work down, turning the lowest areas into parks or wetlands. When the group delivered its proposal at a public hearing, reaction was immediate, vehement, and negative. Nagin skipped the meeting, letting his office announce that he had business in Washington. (In fact, he was vacationing in Jamaica.) Exiting the ULI session, Cynthia Willard Lewis, City Council representative for east New Orleans, told reporters that her African-American neighbors were "not going to allow themselves to be shoved into the back of the bus." Meanwhile, the Bring New Orleans Back commission was also talking to Wallace Roberts & Todd, a Philadelphia planning firm. Its principal, John Beckman, dismissed the ULI's plan to close neighborhoods - "planning for failure," he called it. Thin, bespectacled, slightly stooped, Beckman had worked with the city since the 1970s, when he helped it create a downtown development district. The city's future footprint, Beckman argued, should be determined by New Orleanians themselves: how many choose to return and where they return to. If neighborhoods could not demonstrate viability, their property would be bought out by a new redevelopment authority and set aside until its best use could be determined. As before, the reaction was explosive. Even as Beckman was nervously waiting for the pre-speech hecklers to quiet, the City Council held a press conference to excoriate his ideas as a scheme to strangle the poorest - the blackest - neighborhoods, after which a ULI-type plan would be shoved through. This time Mayor Nagin was in the room. Voters had first elected Nagin, a former Cox executive, in 2002 because of his reputation for straight talk. Despite his later reputation as a loose cannon, he was averse to grandstanding; he was a fact-oriented businessman who promised he would calmly make the tough calls like a CEO. He had spent the first part of his term trying to modernize the decrepit gearwork of city government. But he hadn't bargained on having to rebuild it from scratch. That day Nagin said nothing about the proposal. Two days later he argued that it "is the way we are going to go, with some tweaks" - a position he held for eight days, then rejected. Explaining his reversal to a group of residents, the mayor explained, "I'm a property-rights person." Go ahead and build! Erin Levins went to obtain a building permit two days after Nagin's property-rights speech and got one instantly. By most standards, the permit was unusual: It contained no description of the work to be performed. "They were handing out these things like candy," Levins says. Pressing on, the Bring New Orleans Back commission hired Reed Kroloff, dean of Tulane University's architecture school, and Ray Manning, a respected local architect. Their mandate was to deploy squads of professionals to help the city's 13 districts come up with their own neighborhood plans. Not unreasonably, Kroloff and Manning asked for funds to do this. But the city had no money. And FEMA, then paying most of New Orleans' bills, refused to contribute, leaving Kroloff and Manning high and dry. Incredibly, the City Council established its own rebuilding commission, which in February hired its own pod of consultants - this time a melange of architects and planners from Miami and the city itself. Jaws agape, Kroloff and Manning watched the council award its consultants $3 million and tell them to get cracking on ... a land-use plan. Meanwhile some of the powerful members of the Bring New Orleans Back commission continued to push for Kroloff and Manning, pointing out that they were working with the only citywide plan that existed in written, publicly available form. Letting the rebuilding unfold through ad hoc neighborhood actions, they said, would make sense only if one area's decisions would have no impact on its neighbors, or if the city had unlimited resources to accommodate them all. "They're saying, in effect, 'Go out and be a pioneer, but if not enough other people follow you, then we'll let you be stranded,' " says Craig E. Colten, a Louisiana State University geographer. "You end up punishing the most enterprising for being enterprising." On July 5, ten months after Katrina, all parties agreed - to begin planning. Backed by a $3.5 million Rockefeller Foundation grant, the city's 73 neighborhoods will create and coordinate their own recovery plans. The plans will then somehow be vetted by guidelines from the city planning commission, the City Council, the mayor, the state legislature, the LRA, and FEMA. "The city is betting that its future can be established by a bunch of neighborhoods that are beset with racial suspicions and led by the same local politicians who have failed to do anything right in the past," says Stonecipher, the Shreveport political analyst. "It'll be interesting to see how it comes out. Meanwhile, everyone is going to deal with a vacuum for the foreseeable future." Nagin's argument appears to be that there isn't much to debate because the whole city will rebuild. Wanting to understand how this could be possible, Fortune repeatedly asked the mayor for an interview, but his representatives declined. "We've been over this before," one said. "People from outside the city don't appreciate the love and will to come back that is out there." Another said, "It's all coming back." The second representative invited Fortune to "speak with people on the [Bring New Orleans Back] committee." By coincidence, one such member, Rob Couhig, was quoted that day in the Washington Post scoffing at city officials' "innate beliefs - that people want to return, that there will be jobs." The adherents of this boosterish faith, Stonecipher says, prefer not to think about "the number of people moving out. If you talk to the moving-van companies, they have a view on this that is decidedly downbeat." Even a successful, organized neighborhood like the Levinses' Bancroft Park is dotted with empty, ruined houses; at presstime its Yahoo group was still begging for news on the whereabouts of some families that hadn't been heard from since Katrina. Other homes had been so infrequently visited that late in July, Erin went over and cut down their thigh-high lawns with a machete. Some institutions have managed to come back by themselves. The most important success story may be Tulane University, the city's biggest employer, which reopened in January after having two-thirds of its campus drowned by Katrina. In just four months the university spent almost $200 million restoring buildings; cut hundreds of jobs, including the entire engineering school; purchased and rented housing for displaced faculty and students; established a school for their children and others in its neighborhood; and then persuaded about three-quarters of the student body to return to the ruined city. "In the short run," says Tulane president Scott Cowen, "New Orleans needs a functioning Tulane. But in the long run, Tulane needs a functioning New Orleans." Tulane doesn't have one - the city remains almost paralyzed. Until the rebuilding question is settled, the local bureaucracy will be hard-pressed to decide on such matters as, say, where to lay out bus routes, replace utility lines, and reopen libraries. The state, which has taken over most of the city's public schools, has had to deduce from clues in the neighborhoods which buildings to renovate and staff. Nagin has had to lay off 2,400 city workers and slash spending. Traffic lights in some remote, almost uninhabited neighborhoods work, but not all the lights on major thoroughfares do. After hearing that the problem was caused by the requirement that each repaired light be inspected by the city, the utility, and FEMA, all of which are overstrained, Fortune called the city office of public works one afternoon in March. The woman who responded wouldn't identify herself because, she said, she wasn't an official city representative. Asked if anyone could verify the above theory about why the traffic lights didn't work, she laughed. "Are you kidding?" she said. "There's nobody here." IV. What would Hoover do? "Crevasse" is the Delta term for a levee breach. The worst crevasse in the recorded history of the Mississippi occurred just before dawn on April 21, 1927, at Greenville, Miss. A mass of water as much as 130 feet high roared across an area 50 miles wide and 100 miles long. According to John M. Barry's Rising Tide, a history of the flood, the Greenville crevasse was "more than double a flooding Niagara Falls." So much water rushed out that below it the Mississippi temporarily flowed backward. Even before the Greenville crevasse, six states had begged President Calvin Coolidge for help with earlier flooding. Coolidge, a true conservative, was reluctant to deal with what he considered a local matter. By April he had already rebuffed weeks of appeals. But when the governor of Mississippi telegraphed the horrific news that tens of thousands were caught by the Greenville crevasse, Coolidge realized the flood was too large for the states to handle. Within 36 hours of the break he gathered his cabinet and appointed Commerce Secretary Herbert Hoover to direct the federal response. Historians give Hoover mixed marks as a President, but none doubt his forcefulness. He was a Quaker engineer who came to prominence in World War I by organizing food shipments for millions of European refugees. Two hours after the cabinet meeting, he convened his commission and demanded that they find out what was going on. Then he boarded a special train and went to Mississippi. According to Barry, he spent 60 of the next 71 days in the flood zone. Commandeering a boat, Hoover toured the region, firing off questions, insisting that red tape vanish, delegating, listening, organizing, setting policy. Farther downstream dozens of additional crevasses were expected (and occurred). Hoover wired warnings to local officials and demanded that they establish what he called "concentration camps." His orders came with exact plans for the camps, specifying every detail, from the size of sleeping platforms to the dimensions of latrines. Critically, Hoover mobilized private industry. He persuaded railroads to give free passage to flood victims and to cut their rates on freight, and he selected powerful businesspeople to become "dictators" of local flood commissions. He set up tent cities and asked utilities and transportation companies to fill them with skilled workers for the rebuilding effort. Barry mocks Hoover for his constant press conferences, but this is a mistake: In crises, great leaders must not only be in charge but be seen as being in charge. At this time and place, Hoover was great. He made mistakes, as all leaders do, but he stabilized a grievous situation and gave heart to millions of people. One year later he rode that accomplishment to the White House. Even in our politically polarized time few would dispute that the Bush administration chose a different path. Rather than appointing a "dictator," the President turned Katrina over to something that didn't exist in Hoover's time: FEMA. The agency was effectively forced to run the entire city while it funded cleanup, housed 200,000 evacuees, and channeled relief money to victims - all the while working on the rest of the ruined Gulf Coast (not to mention absorbing its own leadership reshufflings). So far, FEMA has spent more than $28 billion. "That's much more than they've ever been asked to do," says Lapeyre, the Business Council chair. "They're frantic, they're overtaxed, and they make huge mistakes--and there's nobody above them catching those mistakes." When FEMA was found to have lost as much as $2 billion to fraud and waste, he notes, "that was big news to the rest of the country, but we all knew about it here." On Nov. 1, 64 days post-Katrina, the President appointed his version of Herbert Hoover: Donald Powell, head of the Federal Deposit Insurance Corp. Twenty-eight days later Powell paid his first official visit to New Orleans. Like Michael Brown, the notorious ex-chief of FEMA, he had no experience in disaster management. He was a wealthy banker from Texas with a Lone Star belt buckle and a long record of support for the President. In Powell's view, the President had not appointed him "to be a chief executive" but to help local people "solve their own problems." When he got the new job, the soft-spoken, courteous Powell did "a whole lot of listening." His job, he told Fortune, "is to bring people together," not "to attract a lot of attention to myself." Powell's most public role has been to work with the Louisiana Recovery Authority, which coordinates the state's response to Katrina. (The LRA has absorbed some of the members and functions of the now moribund Bring New Orleans Back commission.) Initially the LRA backed a plan by U.S. Representative Richard Baker (R-Louisiana) that would have paid owners of flooded homes at least 60% of their equity, refurbished the salvageable units, and resold them. In January the White House effectively killed the bill; the government, Powell said, shouldn't be "in the real estate business." The decision elicited a chorus of anger in Louisiana. Within a day of the turndown, Isaacson had stormed into the White House, where he met with Karl Rove. Both men have a reputation for using up most of the oxygen in the room. The temperature shot up quickly. Isaacson had been telling anyone who would listen about the administration's disdain for a majority-black city, an accusation that infuriated Rove. "I said, 'You pulled the plug on us. I don't think you care.' He said, 'Why don't you come up with a simpler plan, something direct to homeowners?' " Isaacson laughs. "You know what? In retrospect, they were right in the White House. And we were wrong. It was too complicated." Even as Louisiana politicians fulminated, LRA board member Sean Reilly met with Powell in January at his base in Amarillo. "We went to a luncheon place with a paper tablecloth," says Reilly, a Baton Rouge executive who with his brother runs Lamar Advertising, the nation's third-largest billboard firm. Reilly was a former state legislator who had given up politics to concentrate on his business and his family. When Katrina hit, he jumped back in the fray. Reilly and Powell "pulled out pens and started drawing all over the table in terms of the numbers and categories of homeowners that needed to be covered and the philosophical choices that needed to be made." A central disagreement was the scope of federal responsibility. After providing aid for emergency services, the administration wanted to focus on the levee system, which Washington had long ago accepted as its purview, and on homeowners lacking flood insurance outside the officially designated floodplain - who had, at least in part, based their decision not to buy flood insurance on the grounds that the feds had stated their area was not at risk. Most New Orleanians had a different view of Uncle Sam's role. In a phrase heard again and again in the city, Katrina was a disaster made in Washington, not New Orleans. In most places water did not "overtop" the levees - the levees were broken by a storm surge they were supposed to withstand. In May a research team sponsored by the National Science Foundation and co-led by Robert Bea, a University of California at Berkeley engineering professor, concluded that these breaches, where the levees failed to meet design specifications, were responsible for four-fifths of the water that inundated greater New Orleans. At the lunch with Powell, the LRA's Reilly argued that "if you live behind a federally warranted levee and that levee fails, you shouldn't be penalized if you don't have flood insurance," because the government has effectively promised householders that they won't need insurance for those circumstances. Therefore, Washington had a moral obligation to all New Orleanians damaged by the flood, even the un- or underinsured. Powell, who says Bush gave him strong instructions "to safeguard the taxpayers' money," didn't embrace Reilly's argument quickly. But he eventually did. Using what Reilly calls "almost house-by-house data on the losses" provided by yet another set of consultants, McKinsey, the LRA and Powell hashed out a basic plan that the latter promised to take to the President. After a series of meetings with Governor Blanco, LRA members, and White House officials, the administration announced on Feb. 15 that it would ask for an additional $4.2 billion for rebuilding. In June, Congress provided it. When all funds are combined, New Orleans has $10.4 billion for rebuilding homes and businesses. Under the LRA plan, dubbed the Road Home, building owners whose structures have been classified by FEMA as having suffered major damage or been destroyed will receive the market value of their house up to $150,000, less insurance and FEMA payments. They will be free to use the money to repair or rebuild their existing buildings or relocate elsewhere in New Orleans; they may also sell their property to the state, though people who then leave Louisiana will pay a penalty. All new construction will be required to follow the temporary guidelines FEMA issued in April: Buildings must be at least three feet above grade and three feet above the "base flood elevation," which is the estimated height of a 100-year flood. In practice, there seem to be plenty of loopholes: Nothing changed in any of the projects in Erin Levins's neighborhood, for example. The money will be doled out according to a loophole-free (in theory, anyway) formula by a private contracting firm. "Every penny will be accounted for," Isaacson promises. "No bureaucracy, no waste." By Powell's own account, he has focused on one critical issue at a time. (He is now trying to persuade the insurance industry to provide coverage for returnees.) Unavoidably, though, this piecemeal approach has meant that he has largely sidestepped other policy issues. In addition to being reasonably assured that their neighborhood will not be dotted with empty, decaying houses, returnees must also believe there is a good chance that they will be economically and physically secure - that there will be jobs and, even more important, adequate protection from floods. Today none of that is certain. Of course, these challenges cannot be met overnight. But the political elite has been reluctant even to engage them - a terrible lapse that, perhaps more than anything, blocks progress in reconstruction. Starbucks (Charts), for instance, has returned to only two of its four standalone locations in New Orleans, and Popeye's to 16 of its 36. A major exception is Wal-Mart (Charts); eight of its ten stores in the three-parish area are open. Corporate America, so quick to respond to the immediate humanitarian crisis, has been slow to come back to New Orleans because of the obvious fear that it will have neither customers nor employees. Lack of affordable and available housing has made the staffing problem only worse, Brenda Lockey of the Tenet hospital chain told Fortune in April. "We're experiencing the same challenges as everyone here in bringing back services in a compromised infrastructure," she said. Tenet has since announced plans to sell four of its five area hospitals, including the city's Memorial Medical Center. Partly because of the shortage of workers and worker housing, the number of jobs in education and health in the New Orleans area is down 42%, according to a July report by the Brookings Institution. Jobs in hospitality are down by 35%; trade and transportation, down 28%. Meanwhile, displaced New Orleanians are desperate for jobs: One out of four is unemployed. Many companies have gone to great lengths to help evacuees, an impulse the government has done nothing to encourage. After Katrina and Rita ejected 34,000 Wal-Mart workers from their homes, the company tracked them down and offered jobs in "any Wal-Mart they could get to," says Pam Kohn, senior vice president of Southeastern operations. Trying to help its employees return, Tenet had asked FEMA for trailers. The agency "wouldn't designate them for our employees," Lockey said in the spring. Popeye's, which was founded in New Orleans, also asked about trailers, but was told that they could be used only for its teenage employees - not their families. "I'm not going to stick four 16- to 22-year-old people in a trailer," says Bob Melberth, Popeye's vice president for field services. Government could bring together the oversupply of workers outside the city and the demand for labor inside it, says Robert Pollin, an economist at the University of Massachusetts Political Economy Research Institute, who studies programs to encourage employment and higher wages. Generally, he concedes, government efforts to encourage business to come into an area "have not been a pretty picture" - they invite fraud and abuse as firms seek to obtain the incentive with as little effort as possible. But in this case the state would be helping businesses hire employees that they actually want. "Instead of going through FEMA and its regulations," Pollin says, "let companies themselves buy trailers and cars on the market and submit the bills." James Boyce, one of Pollin's UMass colleagues, agrees: "The record shows that business will respond if asked to do something that makes sense, is within its sphere of competence, and isn't financially suicidal. There's a lot of good will in this country's business sector, but it needs to be called on." To demonstrate his concern for the area, Bush visited New Orleans ten times between September and March. The administration has trumpeted its commitment to spending $107.8 billion to fight the impact of Katrina, Rita, and Wilma - a great deal of money, but it's spread over all five Gulf states. About two-thirds of it went to immediate disaster relief and flood-insurance payments; only about 17% is going to long-term rebuilding and recovery in the worst-hit areas, including levee repair and wetlands reconstruction. Bush did not ask Congress to allocate any money at all for levee repair until Oct. 28, two months after Katrina - and the requested amount, $1.6 billion, was less than a quarter of what the Corps had already stated was necessary. All the while, the administration made no public effort to grapple with the emerging consensus that the flood-protection system it was slowly ponying up for was deeply flawed. According to Robert Bea, the Berkeley engineer, current levee designs contain decades-old misconceptions. Back in the 1950s, Congress asked the Weather Bureau to compare the likelihood of flooding in different parts of the country. The agency developed a unit of measure called the "standard project hurricane," and calculated the likelihood such a hypothetical storm would hit a given area. But Bea says that calculating the chances of a particular city getting hit by a standard hurricane is beside the point. The real issue is determining what you need to do to protect that city from the biggest hurricane it's likely to see. "It's as senseless as saying storms are three times as likely to be dangerous over here, so we need three-foot storm walls," Bea explains. "There's a three in each statement, but they have nothing to do with each other." Nevertheless, Bea says that after Betsy flooded New Orleans in 1965, the Corps incorporated this standard-hurricane yardstick into its engineering plans. The Weather Bureau flagged this fundamental error as far back as 1979, he says, but the Corps has not yet taken the necessary step of reevaluating its levee designs. By contrast, he says, the safety factor for New Orleans levees is 1.3. Surprised by this low standard, Bea and the NSF engineering team traced it back to the 1940s, when the Corps used a 1.3 safety factor to protect agricultural land - cows, in other words - against flooding. By applying the same standard to city levees, he says, the Corps has effectively been treating the people of New Orleans "as if they were as valuable as cattle." In spring, Bea visited a levee section under repair in eastern St. Bernard Parish and learned from the project manager that the levee was not going to be sheathed in concrete: "It was just a hill of dirt." From the Corps he learned that the levee was simply being rebuilt to its previous design. "At that point they kind of shorted out intellectually. I suddenly saw how the engineers in the New Orleans district got trapped into this. These are not noncaring people, they're not evil, and they're not stupid. When they were first building the levees [in the 1960s], there was 100 miles of marshes between them and the Gulf of Mexico. Now those wetlands have disappeared. By letting the marshes wash away, we're turning New Orleans into a coastal city. They need seawalls there, and they're not getting them." The levees could be rebuilt from the ground up, Bea says, "but someone in the federal government would have to ram through the solutions, and I'm not seeing that person." In a 6,000-page report released June 1, the Corps formally admitted its mistakes were responsible for the levee failures. "When that happened, I didn't see the President get up and say, 'We're not going to let this stand,' " Bea says. "Did you?" Six miles from Ruthie Frierson's home is the Greater Asia Baptist Church, across the street from the St. Bernard housing project - the biggest in the city, and among the most dangerous. After the storm, the parishioners were scattered all over the U.S. and Canada. "They all hope to come back," says Pastor Henry Johnson Jr. "So we have got to get the church up and running." It won't be easy. When the levee broke, the water wrenched the church doors open, picked up the heavy wooden pews, and flung them around like toys. Mold devoured what the water didn't. Former Presidents Bill Clinton and George H.W. Bush have created a fund for New Orleans churches, to which Johnson applied. "I might get $35,000," he says. "The rest is up to me and the congregation." When Johnson isn't working on his church or driving a city bus for his day job, he's working on his house, in northeast Gentilly. He gutted the walls himself, only to discover that termites were eating up his home; he had to replace more than 200 studs. Next is the Sheetrock, which he'll hang himself to save money. Maybe he'll ask a neighbor to help - about two-thirds of the residents on his street have returned, more than in a lot of places in town. "We're working together," he says, "helping each other more than we used to, because of Katrina." Johnson has never met Frierson. Before Katrina, they would have had next to nothing in common. But like almost everyone in a city racked by nature and failed by its political elite, they are now aware of their common citizenship. New Orleans, both say, cannot be rebuilt as it was - it will have to be different and better. "We always acted like we were our own little country," Frierson says. "We have to rejoin the United States." Like many others, she sees hope in the patchwork of new volunteer groups working to reconstruct and reform. "I've never seen anything like it," she says. "But I truly don't know if it's enough." REPORTER ASSOCIATE Eugenia Levenson contributed to this article. Small business owners manual: Crisis management in a hurricane.